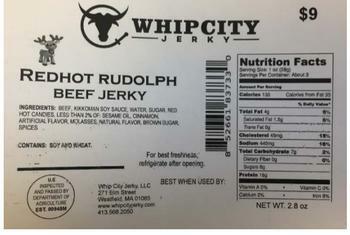 Whip City Jerky of Westfield, Mass., is recalling approximately 1,391 pounds of beef jerky products. 2.8-oz. packages containing “WHIPCITY JERKY BBQ BEEF JERKY,” with BEST WHEN USED BY dates of 020918, 022318, 030218, 030918, 031618 and 032318. 2.8-oz. packages containing “WHIPCITY JERKY BLACK PEPPERED CURRY BEEF JERKY,” with BEST WHEN USED BY dates of 021218, 021918, 022618, 030518, 031218 and 031918. 2.8-oz. packages containing “WHIPCITY JERKY CAJUN BEEF JERKY,” with BEST WHEN USED BY dates of 021118, 021818, 022518, 030418, 031118 and 031818. 2.8-oz. packages containing “WHIPCITY JERKY HAWAIIAN BEEF JERKY,” with BEST WHEN USED BY dates of 021118, 021818, 022518, 030418, 031118 and 031818. 2.8-oz. packages containing “WHIPCITY JERKY HOT ORIGINAL BEEF JERKY,” with BEST WHEN USED BY dates of 020918, 022318, 030218, 030918, 031618 and 032318. 2.8-oz. packages containing “WHIPCITY JERKY JALEPENO BEEF JERKY,” with BEST WHEN USED BY dates of 021118, 021818, 022518, 030418, 031118 and 031818. 2.8-oz. packages containing “WHIPCITY JERKY LEMON PEPPER BEEF JERKY,” with BEST WHEN USED BY dates of 021018, 022418, 030318, 031018 and 031718. 2.8-oz. packages containing “WHIPCITY JERKY MAPLE BEEF JERKY,” with BEST WHEN USED BY dates of 020818, 021518, 022218, 030118, 030818, 031518 and 032218. 2.8-oz. packages containing “WHIPCITY JERKY MESQUITE BEEF JERKY,” with BEST WHEN USED BY dates of 021018, 022418, 030318, 031018, 031718 and 032418. 2.8-oz. packages containing “WHIPCITY JERKY ORIGINAL BEEF JERKY,” with BEST WHEN USED BY dates of 020818 through 032418. 2.8-oz. packages containing “WHIPCITY JERKY PLAIN BEEF JERKY,” with BEST WHEN USED BY dates of 020818, 030118, 030818, 031518 and 032218. 2.8-oz. packages containing “WHIPCITY JERKY RAGIN BUFFALO BEEF JERKY,” with BEST WHEN USED BY dates of 020918, 022318, 030218, 030918, 031618 and 032318. 2.8-oz. packages containing “WHIPCITY JERKY REDHOT RUDOLPH BEEF JERKY,” with BEST WHEN USED BY dates of 021018, 022418, 030318, 031018 and 031718. The recalled products, bearing establishment number “EST. 00948M” inside the USDA mark of inspection, were shipped to retail stores in Massachusetts and Connecticut and sold by way of internet/catalog sales. Consumers with questions may contact Tony Neuser at (413) 568-2050.